Assalamualaikum brother yousef and your team, I have read whole report in one sitting, there is no doubt,it is a master piece. I don’t think anyone else can make it any better or any easy. it is incredible report. You all deserve a big thankyou from everyone, who has a sincere desire to understand the speech of Allah (swt). May Allah reward you with more hikma. Aameen. This report is the answer to every struggling student’s prayers. All those who couldn’t figure out why they couldn’t learn the Arabic language need not look farther. After reading this report, they can come join the class and bring all their former teachers with them. 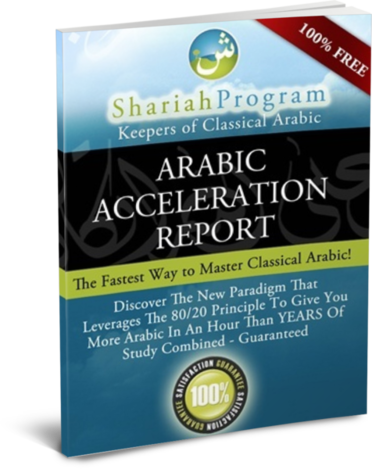 This document exemplifies the excellence of the Shariah Program Classical Arabic Course. This report gives a bird’s eye view of how the Arabic language works and highlights the different sciences that one needs to master in order to fully appreciate the beauty of the language. Anyone who wants to begin the study of Classical Arabic MUST read this report. Alhamdolillah, reading all the different things, but this document is excellent. I just printed it out on my way to work, and I thought i would read some of it, but I couldn’t stop reading. This is so informative and excellent, and amazing. I would recommend every one to read it twice. Masha Allah. Very beneficial. Since I have already went through the videos that covered most/all of this material, it was a very good review for me. A nice tutorial. Ps. You have spelt language wrong on your front page.